During the summer months, it gets hot in Sacramento. 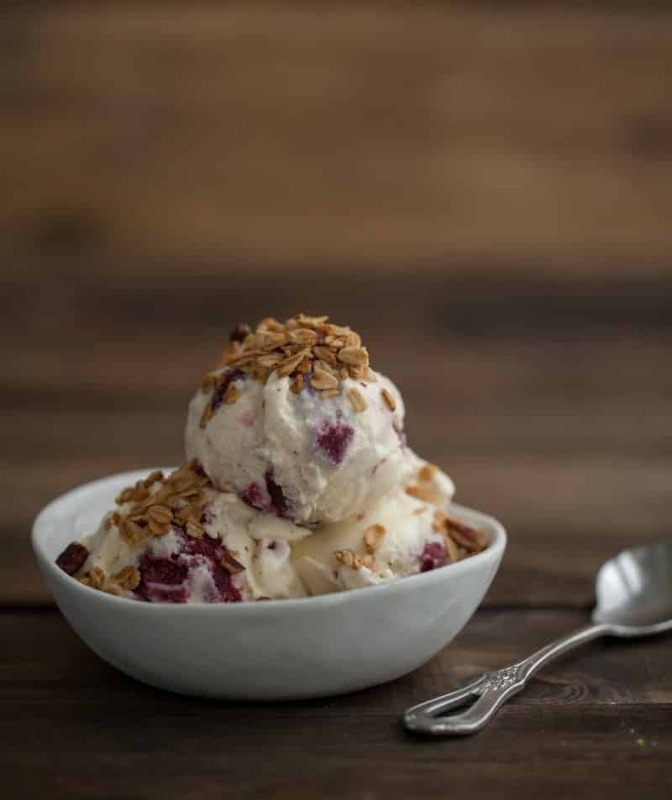 It’s the perfect time to reach for a big bowl of ice cream, especially a solid, homemade ice cream. 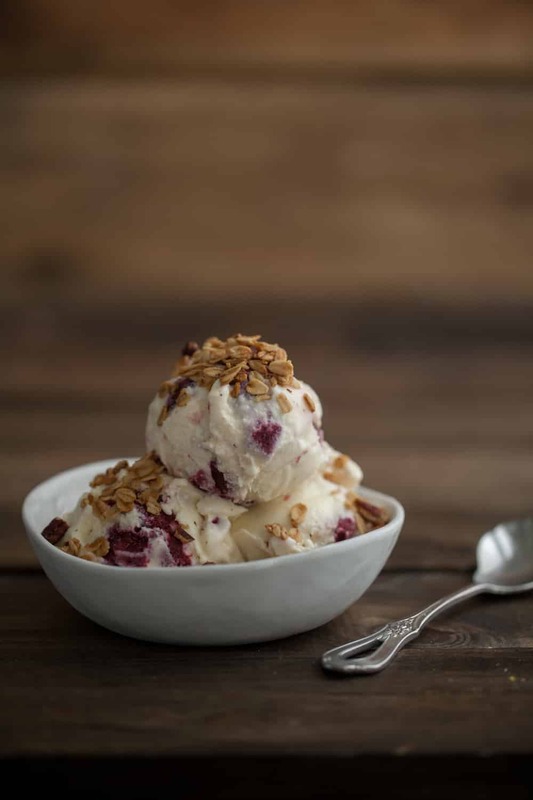 This particular crisp ice cream uses one of my favorite granola recipes and fresh blackberries. The result feels like one of those pricey, store-bought ice cream (but better, at least in my opinion.) I recommend whipping up a large batch of granola to eat and use only a portion in the ice cream. on a quick note, your ice cream may not look like these photos. I didn’t mix the blackberry mixture in with the ice cream. M and I concurred that it would be better mixed in with the ice cream, similar to what I did with the strawberry swirl ice cream. Combine oats, pecans and salt, then whisk together oil and syrup. Pour over oats and continue to stir until all oats are covered. Pour oats on to tray and evenly spread into a thin layer. Bake for 1-1½ hours, stirring every 15 minutes. Granola should be lightly browned and beginning to crisp when done. Remove and let sit until cool. Making the Ice Cream Base: Slice the vanilla bean in half and scrape in to a medium pot. Add in heavy cream, milk, and turn on heat to medium. Bring milk to just before it starts to boil and forms bubbles around the edge. In a separate bowl, whisk together egg yolks and sugar until mixture is lighten in color. Add contents back to the pot and cook until mixture becomes thick and coats the back of a wooden spoon. Let cool completely in the refrigerator. Making the blackberry mixture: Place blackberries in a pot over medium heat. Add in maple syrup and lemon juice. Cook until blackberries have are starting to break down and releasing juices, 6-8 minutes. Combine the cornstarch with 2 tablespoons of water and pour into blackberry mixture. Stir mixture constantly until blackberries thicken, 3-4 minutes. Remove from heat and let cool. Freeze according to machine’s instructions or you or check out this post that has helpful hints on what to do without a machine. When ice cream has thickened, remove half from the ice cream machine and set aside in freezer. Pour in blackberry mixture and continue to run machine until blackberries have blended. Pour into vanilla portion and swirl. Freeze until hard. Beyond being a solid ice cream recipe, I find it’s quite fun to play around with different fruits and flavors (whatever happens to be in season). 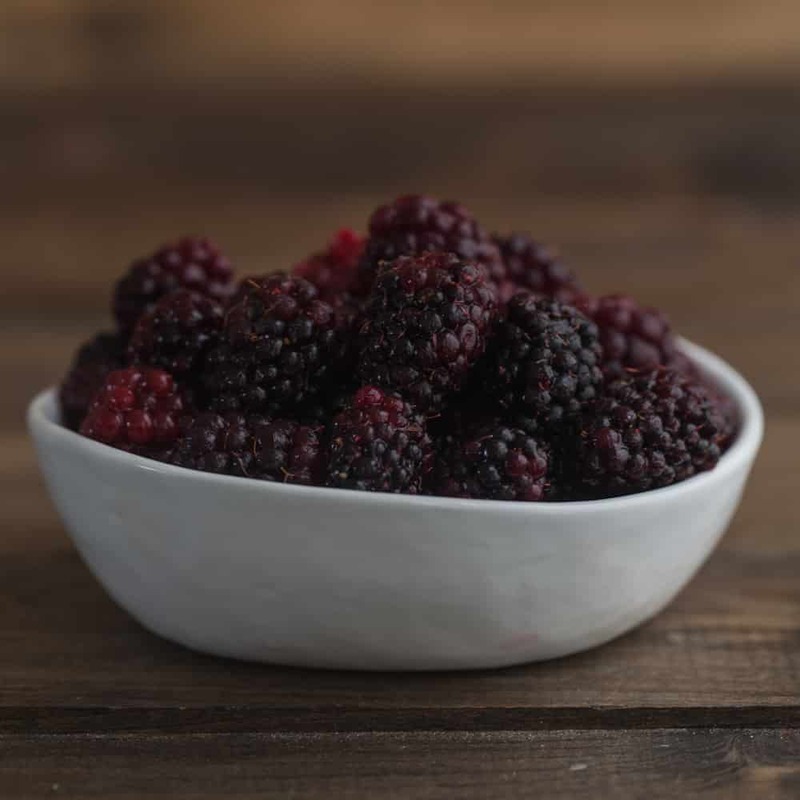 Berries: One of the easiest swaps: switch out the blackberries for raspberries, blueberries, or even peaches. Most things go with this crisp ice cream. Spices: I like tossing a bit of cardamom or cinnamon into the granola- anything to add a touch of warmth. It looks like you had such a lovely day! And great weather for it! Awesome recipe Erin! Oh how I miss black raspberries! I’m from Wisconsin and I haven’t had them since I was in middle school. They grew at the end of our driveway and I would spend the afternoon eating as many as I could. What a delightful little fruit. Thanks for sharing! We called them blackcaps. Mom was from Pennsylvania so she grew up with them. We lived in Washington state so she had to get the whips by mail-order. She planted 6 and Dad built a frame to hold the vines up off the ground as they grew. Our job as kids was to crawl underneath and get all the berries that couldn’t be picked from above. 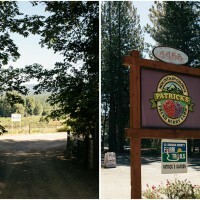 The vines are very thorny so it was a love hate relationship picking them. Grandma would bake pies some of which we ate right away. But most were frozen along with all the other goodies she would bake so we could eat them all winter. To this day black raspberry pie is my favorite even though I haven’t had a slice in at least 35 years.! My hope is that someone will ave them at the farmers market this summer. I live in Ohio now so the odds should be good! Thanks for he post. I hadn’t thought about them in years. Those berries look incredible and this ice cream looks amazing! I am in love with it and if I hade my ice cream maker with me on vacation I would so get up and start making this right now! YUM! Absolute beautiful berries! I want some of that ice cream.. mmmm. I’m so happy you get to spend time with our man, doing stuff like this, I mean what a treat! Love the recipe and all of the pics Miss Talented Lady. What gorgeous photos! And that ice cream looks incredible, especially with that granola topping! I am so amazed at all the kinds of blackberries you guys have! I love the idea of a bit of crunch with my ice cream. Ben and Jerry’s would be proud! I have never picked my own berries! Thank you for the reminder that this is an activity that I need to do soon. Love the pictures and that ice cream! My dad picks blackberries for me every summer. They are so much better than what they sell in the store. I can’t wait to try this unique ice cream with this year’s batch! I miss picking berries — the season is over now here in FL!! Your photos are mesmerizing!! 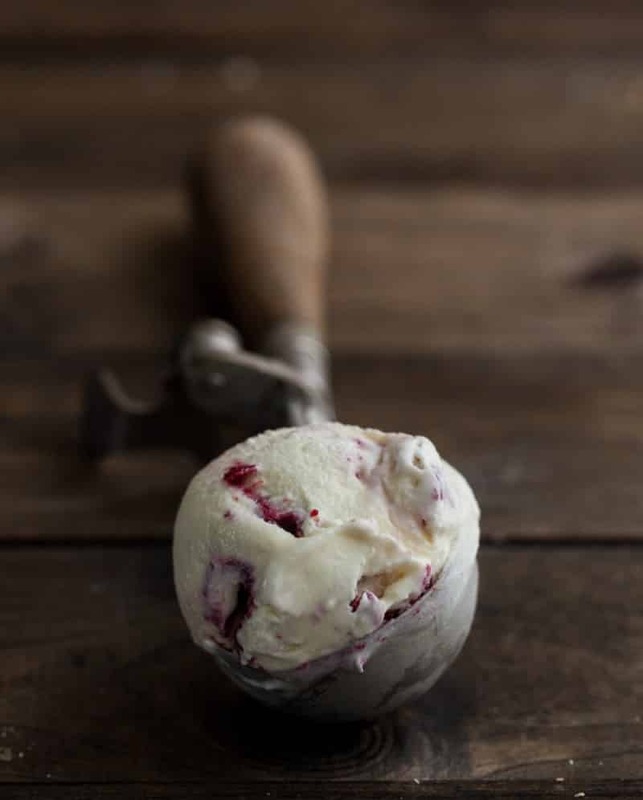 And the blackberry crisp ice cream is sooo dreamy! !